1965 Donruss Disneyland Puzzle Back trading cards show an early history of one of the world's most popular destination spots. The set celebrates the park's tenth birthday. Decades later, they also remain a popular set with both card collectors and Disney fans. 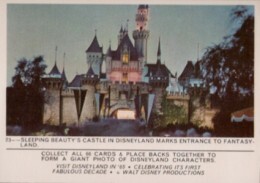 All 66 cards in the 1966 Donruss Disneyland Puzzle Back set have a shot from the theme park on the front. From a historical perspective, it's interesting to see many attractions that no longer exist as well as others that have undergone drastic changes. Images include both park guests enjoying attractions to costumed characters roaming the Disneyland grounds. The bottom of each card has a long caption that describes the scene. They often read like a publicity pitch. 1965 Donruss Disneyland Puzzle Back card backs go together to form a massive puzzle that showcases many of the animated Disney characters. Cards came packaged in yellow wax packs that originally cost five cents. Any info on these cards that are blue backed and have no puzzle?? I have 48 of these cards, 37 unique numbered scenes and 11 repeats. They have been in a box since the 60″s. They are all in pretty good condition, no cracks, bent places, broken corners. I don’t know how crisp or clean the edges were originally, but these are softer, with only minimal fraying. a few have a smudge or spot. They have definitely been handled a few times since they were originally unwrapped. They were kept in a stack with other things and the edges are brownish, not crisp white, if that’s how they looked originally. They were not individually packaged in protectors. Where would you suggest I go to have them evaluated for condition, possible value, and get proper protectors for them. I think I may be interested in marketing them. I also have 4 McHale’s Navy (Fleer) cards #1,4,61, & 64. And a bunch of cards with no identifying marks that would have a partial pictoral and print joke or silly saying on one side and a picture and punch line on the reverse, all from the 60’s era I would assume – know anything about these?